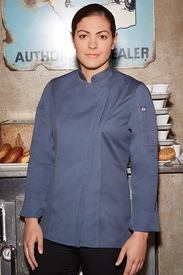 We have added a Slim Fit Range of Women's Chef Coats. They have an updated feminine fit that skims the body for a form-fitting look. 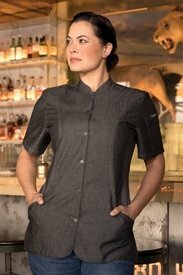 Our Classic Fit Range has a relaxed fit, it's tailored to the female form without compromising the professional look. All our coats are marked either Classic Fit or Slim Fit in the individual description below the item. 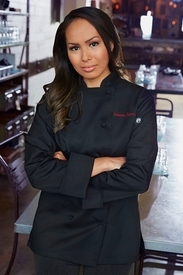 Our Chef Coats for Women are tailored to fit the female physique. With a slightly tapered waist, and gently flared hip area, plus proportional sleeve length and options like "French" fold-back cuffs, these coats have a slender and flattering fit. 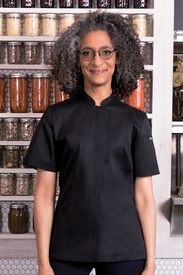 The Research and development department fitted this range on many female chefs at National Trade Shows over an extended period. The results? Sizing conducive to a woman�s figure, appropriate sleeve lengths, no excess material under the arms (thanks to the tapered style), and a relaxed hip area and streamlined waist to ensure a professional feminine appearance. 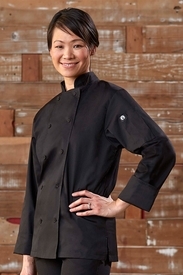 Our Chef Coats for Women cover the full spectrum of styles, colors and features to clothe even the most discerning female chefs. 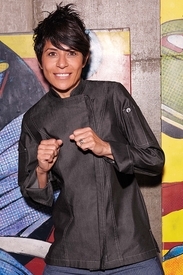 The range starts off at the basic level with the fashionable "lite" SOFIA Chef Jacket, and the very affordable LE MANS Chef Jacket for Women. They make good quality sense for the hardworking chef and suit the budget of an eager culinary student. 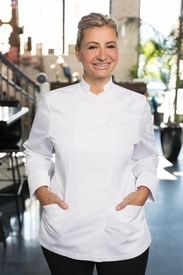 The collection builds to the Executive MARBELLA (available in White, Black,) and our PINSTRIPE JACKET is a beautiful cross-over from the "Business Exec to the Executive Chef", it's perfect for personal chefs and restauranteurs. 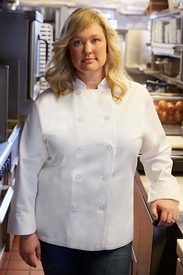 The latest trends in chef fashion are sophisticatedly stitched into the Signature Series VERONA Cool Vent Chef Coats for Women (also available in White or Black). 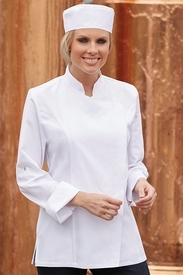 Note the refined luxury in our elegant ELYSE Egyptian Cotton Women�s Chef Jacket. To create a personal touch, add custom embroidery to the jacket by simply checking the "Embroidery $5 Per Line" box directly located on each product page. Visit our Embroidery info page to view the font styles and available thread colors. It's the perfect way to personalize a gift.